A tooth that has been damaged due to trauma or infected due to decay or abcess may need root canal treatment. A rubber filling is placed in the root(s) of the tooth, then this is restored with a normal filling. It is sometimes recommended that the tooth is crowned after this treatment. If you think you need a root canal, consult your dentist. There are a number of steps that occur over a few surgery visits. 1. X-ray – if a dentist suspects you may need a root canal, he will first take X-rays or examine existing X-rays to show where the decay is located. 2. Anesthesia – local anesthesia is administered to the affected tooth. Contrary to popular belief, a root canal is no more painful than a filling. 3. 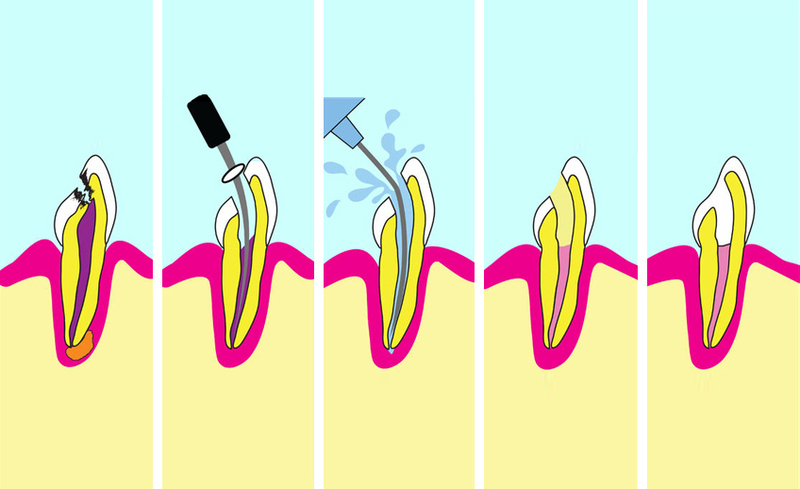 Pulpectomy – an opening is made and the diseased tooth pulp is removed. 4. Filling – the roots that have been opened (to get rid of the disease pulp) are filled with gutta-percha material and sealed off with cement. •	Practice good oral hygiene – brush teeth twice a day, and floss at least once. Taking care of your teeth can help prevent future problems. •	Visit the dentist regularly – cleanings and examinations by dentists and hygienists. •	Avoid chewing on hard foods – chewing on hard foods such as ice can cause teeth to break, and can harm root canals.